On February 12th, 2018, President Trump presented his budget request for fiscal year 2019 (FY19) to Congress, outlining his spending priorities for the coming year. The FY19 budget request calls for $4.4 trillion to fund government operations in the next fiscal year, including just $540 billion in non-defense discretionary budget authority, down from $579 billion in FY18. In so doing, it cuts education, health, and child welfare funding. On the mandatory side of the ledger, the budget uses various policy proposals to effectively gut funding for housing and nutrition assistance, health programs, and income support. If implemented, the cuts proposed in this budget would be devastating to low-income families with children who are struggling to make ends meet and would result in an increase of child poverty in the U.S. This fact sheet will look in greater detail at policy proposals in the budget that impact the economic security of families with children. 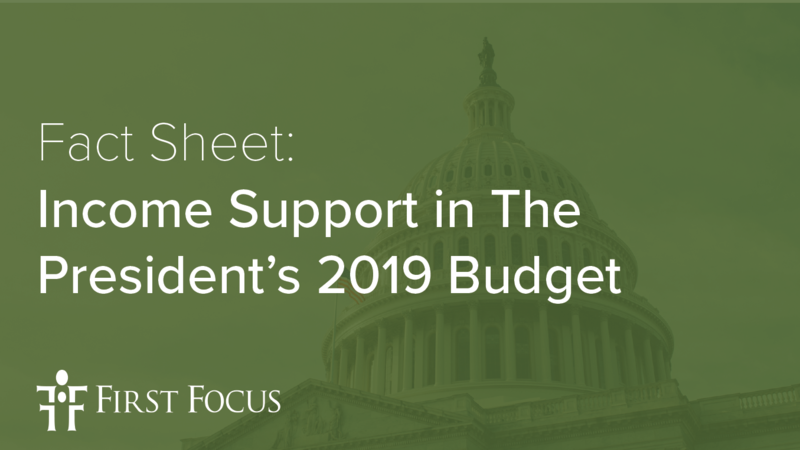 Because spending on income supports for income support programs is mandatory, however, the resources dedicated to this area of the President’s budget are generally projections of what will be spent. Where are there notable policy changes for particular programs, those proposals are noted.